The Avengers are a series of fictional superhero teams that have starred in The Avengers and related comic book series published by Marvel Comics. Over the years, the teams have featured a rotating lineup composed of a large number of characters. Characters listed in bold are the members of the team as of 2019. Cover art for Avengers (vol. 3) #1. Art by George Pérez. All of these members helped form the team in The Avengers #1 (September 1963). Iron Man Anthony Edward "Tony" Stark Avengers #1 (September 1963) Founder of original roster. Joined West Coast Branch in West Coast Avengers vol. 2 #1 (1984). Current member of the main Avengers team. Current member of the main Avengers team. and The Wasp Henry Jonathan "Hank" Pym Former leader of Avengers A.I. and Avengers Academy. Currently merged with Ultron into a cyborg. Wasp Janet van Dyne Active with West Coast team in West Coast Avengers vol. 2 #32 (1988). Current member of the Avengers Unity Squad. Hulk Dr. Robert Bruce Banner Resigned from the team in Avengers #2 (November 1963), rejoins the Avengers in Avengers vs. X-Men #11. Former member of the main Avengers team. Commander Rogers Steven "Steve" Rogers Avengers #4 (March 1964) Given retroactive "founding member" status in place of the Hulk. Active as The Captain in Avengers #300 (1989). Former leader of the Avengers Unity Division as Steve Rogers. Current member of the main Avengers team. Ronin Clinton Francis Barton Avengers #16 (May 1965) First active as Goliath in Avengers #63 (April 1969). Founding West Coast chair, Avengers #243. Joined the New Avengers as Ronin in New Avengers #27 (2007). Former member of the main Avengers team, and the Secret Avengers. Former member of the Avengers Idea Mechanics. Former member of Occupy Avengers. Quicksilver Pietro Maximoff Joined West Coast branch in Avengers West Coast #56. Joined the Mighty Avengers in Mighty Avengers #24. Former teacher at the Avengers Academy. Former member of the Avengers Unity Division. Scarlet Witch Wanda Maximoff Joined West Coast branch in West Coast Avengers Vol. 2 #37. Apparently de-powered at the end of House of M. Re-emerged fully powered in Avengers Children's Crusade. Rejoined team in Avengers vs X-Men #7. Current member of the Avengers Unity Squad. Swordsman Jacques Duquesne Avengers #20 (September 1965) Expelled in Avengers #20 (September 1965). Readmitted in Avengers #114 (August 1973). Killed in Giant Size Avengers #2 (November 1974). Returned to life in Chaos War: Dead Avengers #1 (January 2011). (alias Harry Cleese) Avengers #45 (October 1967) Former member of the main Avengers team. (a.k.a. Luke Charles) Avengers #52 (May 1968) Former member of the Ultimates. Current chairperson of the main Avengers team. Vision Victor Shade (alias) Avengers #58 (November 1968) Joined West Coast branch in West Coast Avengers Vol. 2 #37. Former member of the main Avengers team. Destroyed by Hulk in Avengers Vol. 1 #685. Black Widow Natasha Alianovna Romanoff Avengers #111 (May 1973) Originally offered membership between Avengers #44 (September 1967) and Avengers #45 (October 1967). Former member of the Secret Avengers and the main Avengers team. Deceased as of end of "Secret Empire" storyline. Mantis Brandt (surname) Giant-Size Avengers #4 (June 1975) Resident of Avengers Mansion in Avengers #114 (August 1973). Originally given probationary status in Avengers #137 (July 1975). Former member of the Secret Avengers. Former member of Avengers Unity Division. Moondragon Heather Douglas Originally given probationary status in Avengers #137 (July 1975). Hellcat Patricia "Patsy" Walker Originally given probationary status in Avengers #148 (February 1976). Two-Gun Kid Matthew J. "Matt" Hawk Avengers #174 (August 1978) Time traveler from the 19th century; joined as a reserve member. Originally given honorary status in Avengers #147 (May 1976). Captain Marvel Carol Susan Jane Danvers Avengers #183 (May 1979) Active as Warbird in Avengers vol. 3 #4 (1998). Former member of the New Avengers and the Ultimates. Current member of the main Avengers team as Captain Marvel. a.k.a. Captain America Samuel "Snap" Thomas Wilson Avengers #184 (June 1979) Former leader of the main Avengers team. Wonder Man Simon Williams Avengers #194 (April 1980) Originally given probationary status in Avengers #156 (February 1977). Founding West Coast member. Former leader of the Revengers. Tigra Greer Grant Nelson Avengers #211 (September 1981) Founding West Coast member. Former teacher at the Avengers Academy. She-Hulk Jennifer Walters Avengers #221 (July 1982) Former member of the Mighty Avengers. Former leader of A-Force. Current member of the main Avengers team. Spectrum Monica Rambeau Avengers #231 (May 1983) Originally made a member-in-training in Avengers #227 (January 1983). Active as Photon in Avengers Unplugged #5 (1996). Former member of the Mighty Avengers and current member of the Ultimates as Spectrum. Starfox Eros Avengers #243 (May 1984) Originally made a member-in-training in Avengers #232 (June 1983). a.k.a. The Sub-Mariner Namor McKenzie Avengers #262 (December 1985) Former member of the Illuminati and the Invaders. Killed in Squadron Supreme vol. 4 #1 (2016). Revived when that event was erased from timeline. Doctor Droom Dr. Anthony Ludgate Druid Avengers #278 (April 1987) Killed in Druid #4 (August 1995). Avengers members recruited by Hawkeye as the West Coast Avengers chair. (September 1984) Founding West Coast member. Former member of the New Avengers and Secret Avengers. (June 1986) Accepted membership after assisting West Coast team, but left before official vote was taken. Former member of the New Avengers and the Guardians of the Galaxy. (June 1987) Gained full membership in West Coast Avengers vol. 2 #33. (1987) Given reserve status after assisting West Coast team. (January 1989) Recruited by The Captain for East Coast team, but presumed killed before official vote was taken. Former member of the Revengers. a.k.a. Hero Gilgamesh Avengers #300 (February 1989) Presumed killed in Avengers #391 (October 1995). Returned in Eternals (vol. 4) #3 (October 2008). Mister Fantastic Reed Richards Former member of the Illuminati and Fantastic Four. Invisible Woman Susan Storm Richards Former member of the Fantastic Four and Avengers. (May 1989) Appointed to West Coast team by government. Left during UN Charter, and later gained official membership. Quasar Wendell Elvis Vaughn Avengers #305 (July 1989) Originally given probationary status in Avengers Annual #18 (1989). (November 1989) Former member of the Secret Avengers and the Invaders. Stingray Walter Newell Avengers #319 (July 1990) Given reserve status as caretaker of Avengers Island. Spider-Man Peter Benjamin Parker Avengers #329 (February 1991) Joined as a reserve member. Former member of the New Avengers, while serving concurrently as a member of the Future Foundation. Former member of the Avengers Unity Division. Former member of the main Avengers team. (Reserve Substitutes) Never gained full membership. Resigned in The Amazing Spider-Man vol. 2 #4 (1999). Current member of the Frightful Four. Rage Elvin Daryl Haliday Never gained full membership. Was discovered to be still in his adolescence in Avengers #341 (November 1991) and was demoted to trainee status. Status revoked in New Warriors #26.
a.k.a. X-51 Aaron Stack (alias) Avengers West Coast #69 (April 1991) Given reserve status after assisting West Coast team. Active in Avengers West Coast #83 (June 1992). Removed from roster in X-51 #4 (1999). Crystal Crystalia Amaquelin Maximoff Avengers #343 (January 1992) Originally given probationary status in Avengers #336 (August 1991). a.k.a. Thor Eric Kevin Masterson Active as Thunderstrike in Avengers #374. Killed in Thunderstrike #24 (September 1995). Darkhawk Christopher Powell Avengers West Coast #94 (May 1993) Joined as a reserve member. Justice Vance Astrovik Avengers vol. 3 #4 (May 1998) Joined as a reserve member. Promoted to full status in Avengers vol. 3 #7 (1998). Formerly a teacher at the Avengers Academy. Former member of the New Warriors. Firestar Angelica "Angel" Jones Joined as a reserve member . Promoted to full status in Avengers vol. 3 #7 (1998). Retired in Civil War: Front Line #2. Former member of the New Warriors and the Young Allies. Currently a member of the X-Men. a.k.a. 3-D Man Delroy Garrett Avengers vol. 3 #27 (April 2000) Currently active as 3-D Man in the Agents of Atlas. Silverclaw Maria de Guadalupe Santiago Avengers vol. 3 #30 (July 2000) Joined as a reserve member. Active in Avengers vol. 3 #43-55. Jack of Hearts Jack Hart Avengers vol. 3 #38 (March 2001) Gained full membership in Avengers vol. 3 #43 (August 2001). Died in Avengers vol. 3 #76 (February 2004). Revived in Marvel Zombies Supreme #2 (2011). Ant-Man Scott Lang Avengers vol. 3 #57 (October 2002) Gained full membership in Avengers vol. 3 #62 (February 2003). Seemingly killed by a zombie Jack of Hearts under influence of the Scarlet Witch in Avengers #500 (September 2004). Rescued moments before his apparent death by the Young Avengers and brought several years into the future by the Scarlet Witch in Avengers: The Children's Crusade #5 (June 2011). a.k.a. Lionheart Kelsey Leigh Shorr Avengers vol. 3 #81 (June 2004) Made an honorary member as Kelsey Leigh, and a full member as Captain Britain. She is one of only two members, the other being Henry Pym, who have Avengers status in both their civilian and superhero guises. The New Avengers were formed due to a mass break-out at the super villain prison The Raft. (March 2005) Former leader of the New Avengers. Left the team in New Avengers vol. 2 #30. Former leader of the Mighty Avengers. (June 2005) Current member of the Savage Avengers and X-Men. Former member of the main Avengers team and the Avengers Unity Squad. Maintained simultaneous membership in the Avengers and the X-Men. (October 2005) Became a member of the Mighty Avengers after the Civil War and the Dark Avengers during Dark Reign. Went rogue in Siege #3 before being killed in Siege #4. (November 2005) (as Ronin) Joined as Ronin in New Avengers #11 (2005); active as Echo in New Avengers #27 (2007). Killed in Moon Knight vol. 4 #9. The New Avengers became a splinter group that chose not to comply with federal superhuman registration, as opposed to the governmental-sanctioned team presented in Mighty Avengers then Dark Avengers. The Mighty Avengers after the Dark Avengers launch was an international agency sanctioned team. (May 2007) Became member of the Dark Avengers. Killed in Siege #2. (March 2009) Helped assemble a new Mighty Avengers team after the beginning of Dark Reign. Jocasta Jocasta Jocasta was previously granted provisional status in Avengers vol. 1 #197. She left the team before she was to be offered substitute status with the team, in Avengers vol. 1 #211. Former teacher at the Avengers Academy. (April 2009) Killed in Avengers: The Children's Crusade #8. Resurrected in Avengers World #16. Vision Jonas (alias) Killed in Avengers: The Children's Crusade #9. Characters who have officially joined the Avengers after the events of Dark Reign and Siege. a.k.a. Winter Soldier James Buchanan "Bucky" Barnes Avengers vol. 4 #1 (May 2010) Originally joined the New Avengers in New Avengers (vol.1) #48 (January 2009). Apparently died in Fear Itself #3, but was recently revealed to be alive and re-assuming his identity as the Winter Soldier. Spider-Woman Jessica Drew Originally joined the New Avengers in New Avengers vol.1 #48 (January 2009). Quit the team in Spider-Woman vol. 5 #4 (February 2015). Valkyrie Brunnhilde Secret Avengers vol. 1 #1 (May 2010) Former members of the Secret Avengers. Nova Richard Rider Left the Secret Avengers, to participate in The Thanos Imperative. Presumed killed in The Thanos Imperative #6. Revealed to be alive in Nova vol. 6 #11 (September 2016). Black Ant Eric O'Grady Killed and replaced by a Life Model Decoy in Secret Avengers vol. 1 #23 (February 2012). a.k.a. Daredevil Daniel Thomas Rand-Kai New Avengers vol. 2 #1 (June 2010) Originally joined in New Avengers vol. 1 #27 (February 2007). Knightress Jessica Campbell Jones Originally joined as Jewel in New Avengers Annual #3 (December 2009). Left the team in New Avengers (vol. 2) #24. Former member of the Mighty Avengers. a.k.a. Marvel Boy Noh-Varr Avengers vol. 4 #6 (December 2010) Left the main team in Avengers vol. 4 #27. Current member of the West Coast Avengers as Marvel Boy. Doctor Strange Stephen Vincent Strange New Avengers vol. 2 #7 (December 2010) Originally joined in New Avengers vol. 1 #27 (February 2007). Current member of the main Avengers team. Red Hulk Thaddeus E. "Thunderbolt" Ross Avengers vol. 4 #12 (June 2011) Former member of the Thunderbolts. 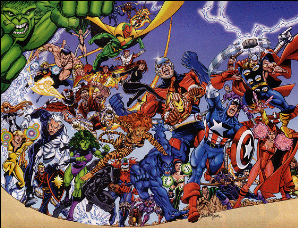 After the Fear Itself event, the lineup of the Avengers teams was shifted by Captain America during the Shattered Heroes storyline. (November 2011) Left the team in New Avengers (vol. 2) #24. Current member of the X-Men. Quake Daisy Johnson Agent of S.H.I.E.L.D. and former member of the Secret Warriors. (January 2012) Asked by Steve Rogers to join the Avengers in Age of Heroes #1. After the Avengers vs. X-Men event, members from both Avengers and X-Men teams were shifted by Captain America during the Marvel NOW! storyline. a.k.a. Citizen V Roberto da Costa Avengers vol. 5 #1 (December 2012) Former member of the main Avengers team. Former leader of the U.S.Avengers as Citizen V.
Manifold Eden Fesi Former members of the main Avengers team. Hyperion Marcus Milton Former member of the main Avengers team. Current member of the Squadron Supreme. Rogue Anna Marie Uncanny Avengers #4 (January 2013) Former member of the Avengers and the X-Men. Sunfire Shiro Yoshida Uncanny Avengers #5 (February 2013) Former member of the Avengers Unity Squad. Doombot Avenger Avengers A.I. #1 (July 2013) Former member of the Avengers A.I. Squad. Characters that joined the team during the Infinity event. Abyss Avengers vol. 5 #17 (October 2013) Former members of the main Avengers team. Killed in New Avengers vol. 3 #32 (May 2015). Nightmask Adam Blackveil Former member of the main Avengers team. Star Brand Kevin Connor Former Member of the main Avengers team and Killed in Marvel Legacy (2017). Alexis The Protector Alexis Avengers A.I. #3 Former member of the Avengers A.I. Squad. a.k.a. Blade Eric Brooks Mighty Avengers vol 2 #1 First appeared as "Spider Hero". Revealed as Blade in Mighty Avengers vol. 2 #9. Joined as Blade in Avengers vol. 8 #11. Blue Marvel Adam Brashear Mighty Avengers vol 2 #2 Former member of the Mighty Avengers and the Ultimates. Power Man Victor Alvarez Mighty Avengers vol 2 #3 Former students at Avengers Academy, former members of the Heroes for Hire. Former members of the Avengers Idea Mechanics. Kaluu Kaluu Captain America and the Mighty Avengers #1 (November 2014) Former member of the Mighty Avengers. Brother Voodoo Jericho Drumm Avengers & X-Men: AXIS #9 (December 2014) Current member of the Savage Avengers. Former member of the Avengers Unity Squad. Sabretooth Victor Creed Uncanny Avengers vol. 2 #1 (January 2015) Former member of the Avengers Unity Squad. Validator Michaud Avengers (vol. 5) #39 (February 2015) Former member of Sunspot's Avengers and Omega Flight. a.k.a. Enigma Aikku Jokinen Former member of the Avengers Idea Mechanics and the U.S.Avengers. Thor Jane Foster All-New All-Different Avengers (May 2015) Former member of the main Avengers team. Ms. Marvel Kamala Khan Former members of the main Avengers team. Deadpool Wade Wilson Avengers #0 (October 2015) Former member of the Avengers Unity Division. Synapse Emily Guerrero Current members of the Avengers Unity Division. Songbird Melissa Gold Former field leader of the Avengers Idea Mechanics. Squirrel Girl Doreen Green Former member of the Avengers Idea Mechanics and U.S.Avengers. Wiccan William Kaplan Former members of the Avengers Idea Mechanics. Cable Nathan Summers Uncanny Avengers vol. 3 #4 (January 2016) Former member of the Avengers Unity Division. Medusa Medusalith Amaquelin Boltagon A-Force vol. 2 #1 (January 2016) Former members of A-Force. a.k.a. Rescue Toni Ho U.S.Avengers #1 (March 2017) Current members of the U.S.Avengers. Wheels Wolinski Nico Wolinski Occupy Avengers #7 (August 2017) Former member of Occupy Avengers team and the Wolfpack. Ghost Rider Robbie Reyes The Avengers Vol. 8 #1 (July 2018) Current member of the main Avengers team. (born Francis Castiglione) Savage Avengers Vol. 1 #1 (May 2019) Current member of the Savage Avengers. Former member of Code Red, Thunderbolts and Heroes for Hire. Elektra Elektra Natchios Current member of the Savage Avengers. Former member of Code Red, Thunderbolts, The Hand and The Chaste. Conan the Barbarian Conan Current member of the Savage Avengers. Venom Eddie Brock Current member of the Savage Avengers. Former member of the Sinister Six, Savage Six and the Venom-Army. Heroes that have been granted honorary status during their lifetime or posthumously for acts of great courage and/or sacrifice. (by affiliation only) Posthumously awarded honorary membership. Whizzer Robert L. Frank Sr. Avengers #173 (July 1978) Died in Vision and Scarlet Witch #2 (December 1982). Moira Brandon Moira Brandon Avengers West Coast vol. 2 #100 (November 1993) Honorary founding member of the West Coast team. Status given in flashback taking place before West Coast Avengers vol. 1. (September 1984) Honorary founding member of the West Coast team. Status confirmed in The Official Handbook of the Marvel Universe. Marrina Marrina Smallwood Avengers #282 (August 1987) Wife of Namor; honorary member while he served on the team. Revived during the Chaos War (January 2011). Yellowjacket Rita DeMara Avengers Annual #17 (1988) Made honorary member after assisting an East Coast reserve team. Killed by Iron Man (Stark) in Avengers: The Crossing (September 1995). Returned to life in Chaos War: Dead Avengers #1 (January 2011). Swordsman Phillip Jarvert Avengers #357 (December 1992) Alternate universe Avenger & Gatherer. (as a probationary member) Never gained full membership. Given honorary status in Avengers #399 (June 1996). Killed in Annihilation Conquest: Star-Lord #2 (August 2007). Restored to life in Chaos War: Dead Avengers #5. Masque Guillietta Nefaria (birth name), Whitney Frost (legal name) Avengers #393 (April 1996) A clone of Madame Masque. Killed in Avengers vol. 3 #34 (November 2000). Iron Man Anthony Edward Stark Avengers: Timeslide (1996) An alternate adolescent version of the original from reality 96020. Replaced him for a time and then merged with the original Stark. (September 2010) Died in One Month To Live #5 (September 2010). Ms. Chloe None The Unbeatable Squirrel Girl Vol. 2 #36 The ghost of a librarian who died years ago. At the suggestion of Squirrel Girl, she is given a costume and briefly joins the Avengers to fight crime before returning to her job as an "overnight librarian". A group of superheroes from the 31st century, the Guardians of the Galaxy time traveled to the 20th century in vol. 1 #168 (February 1978) and served as honorary members during the Korvac saga. Vance Astro Vance Astrovik A younger, alternate version of him also later joined as the superhero Justice (a.k.a. Marvel Boy, see above: Post-Heroes Return recruits, 1998). A group of teenage heroes modeled after the Avengers, the surviving Young Avengers were awarded honorary membership following the "Children's Crusade" storyline. (May 2012) Awarded honorary membership by Captain America. The Avengers promoted several senior Academy students to "Avengers Third Grade", as part of a plan to eventually award them full Avengers membership. (December 1987) Created to look exactly like Hawkeye to infiltrate the West Coast Avengers. (December 1987) Created to look exactly like Tigra to infiltrate the West Coast Avengers. (May 1988) Posing as Nebula at the time, and better known as Terminatrix. Started placing the East Coast division under mind control as of #291 (May 1988). Unofficial leader as of #294 (August 1988). "Officially" joined in #297. Reported MIA minutes later. East Coast division consequently disbanded (November 1988). (February 1993) Skrull who replaced the kidnapped Barbara Morse as Mockingbird in order to infiltrate the team, as revealed in a retcon in Secret Invasion #8 (January 2009). She was slain by Mephisto in Avengers West Coast #100 (November 1993), although her ghost or spirit has been seen a few times since True name revealed in Official Handbook of the Marvel Universe A to Z #1 Softcover in the updates section. (March 1993) Infiltrated the team as a representative of the Gatherers. He impersonated the Vision, and was seemingly destroyed by Proctor, before being defeated by Vision. (March 2005) Joined the Mighty Avengers (Initiative team) in Mighty Avengers #7 (November 2007). Revealed in New Avengers #42 (August 2008) to have been a Skrull. Killed by Norman Osborn in Secret Invasion #8 (January 2009). (March 2009) Joined and assembled the Mighty Avengers in Mighty Avengers #21 (March 2009). Revealed in Mighty Avengers #29 (November 2009). (March 2012) Infiltrated the Secret Avengers as a Life Model Decoy impersonating Eric O'Grady. Supposedly destroyed alongside the other Descendents. (December 2012) Due to a body swap that occurred during The Amazing Spider-Man #698, Peter Parker was replaced by Otto Octavius as Spider-Man on the Avengers, with the other members unaware of the switch. Under probation after The Superior Spider-Man #8 for various violent acts. Left team in The Superior Spider-Man #26 to avoid an incriminating brain scan. Peter Parker later regained his body and subsequently became a member again. (May 2016) Due to Kobik's warped view of the world thanks to the Red Skull's upbringing, when Kobik restored Steve Rogers to health, she "improved" him by altering his history so that he was always a HYDRA deep cover agent. Her memories of the real Cap she contained within herself. "Stevil" manipulated the Avengers, SHIELD, and the superhero community as he went up the HYDRA ranks, becoming its leader and conquering America. Eventually realizing her creation was a monster, Kobik freed and restored the true Captain America, who defeated his evil doppelganger. Avenger X Cressida Avengers Vol. 7 #2.1 (December 2016) Retconned as an additional member of Captain America's Kooky Quartet before betraying the team. Currently stuck in the Microverse. Voyager Va Nee Gast, a.k.a. Valerie Vector The Avengers #675 (March 2018) Appeared to be retconned as a founding member of the Avengers who had been erased from the timeline. This proved to be a ruse set up by her father, the Grandmaster. As revealed in New Avengers #10 (March 2011). A group of heroes independently formed their own branch of Avengers, as Great Lakes Avengers, in West Coast Avengers vol. 2 #46 (July 1989), with no official status. Later known as the Lightning Rods (after the Thunderbolts during Heroes Reborn), they eventually switched their name back. In the GLA Misassembled miniseries, the team was contacted by the Maria Stark Foundation and forced to change their name. They chose the Great Lakes X-Men. In The Thing #8, they changed their name again to the Great Lakes Champions. Since the Civil War, the team has been known as the Great Lakes Initiative. In the new ongoing Great Lakes Avengers series, the team was made official members of the Avengers due to a legal technicality. A few issues later, their membership was revoked. Justice and other former members of the New Warriors eventually left The Initiative to form Counter Force, with the purpose of ensuring that The Initiative stayed true to their goal of training new and undeveloped superhumans. After Camp Hammond was shut down, Tigra and Gauntlet joined the New Warriors who had left the Initiative, and they formed the Avengers Resistance, with the specific purpose of exposing the criminal deeds of Norman Osborn. During the AXIS storyline, Magneto assembles an unnamed group consisting of Absorbing Man, Carnage, Deadpool, Doctor Doom, Enchantress, Hobgoblin, Jack O'Lantern V, Loki, Mystique and Sabretooth to combat the Red Skull. When the Red Skull was defeated, the villains went their separate ways, but were inverted due the spell cast by Scarlet Witch and Doctor Doom. The inverted villains were reassembled by Steve Rogers when he noticed something was wrong with the Avengers and X-Men to assemble an effective resistance against the heroes after the other Avengers - with the exception of Spider-Man and Nova - were captured, naming the new team the Astonishing Avengers. During the subsequent fight, Carnage sacrifices himself to prevent the inverted X-Men detonating a 'gene bomb' that would have killed every non-mutant in the blast radius, with the fight concluding with the rest of the 'Astonishing Avengers' - with the exception of Sabretooth, who was protected by a shield generated by Iron Man - being returned to normal. However, the team left a video message claiming responsibility for the heroes' actions while corrupted before they returned to their own villainous ways, identifying themselves as the 'Axis of Evil', allowing the Avengers and X-Men to rebuild their reputations. During the Secret Empire storyline, the Hydra regime has their own Avengers, consisting of Odinson, Deadpool, Scarlet Witch, Vision, Taskmaster, Black Ant, and Superior Octopus as their leader. However, Odinson only served on this team because he was psychologically broken due to his current state of unworthiness prompting him to side with Rogers after his old ally still proved capable of lifting his hammer, while Scarlet Witch was possessed by Chthon and the Vision was being controlled by an A.I. Virus placed in him by Arnim Zola. In the final stand, Odinson returned to his old allies as he recognized that Rogers had gone too far, while the Vision's daughter Viv and Brother Voodoo restored the Vision and the Witch to normal respectively. While Deadpool defected, Taskmaster and Black Ant turning against Hydra in exchange for future amnesty. ^ "Hawkeye Rejoins The Avengers". Comic Book Resources. Retrieved February 5, 2010. ^ Official Marvel Index to the Avengers Vol. 2 #1 (October 1994). Published by Marvel Comics. ^ a b c d Official Marvel Index to the Avengers vol.2 #3 (December 1994). Published by Marvel Comics. ^ a b c d e f g h i j k l m n o p The Avengers Log #1 (February 1994). Published by Marvel Comics. ^ a b c d e Avengers #305 (July 1989). Published by Marvel Comics. ^ a b Official Marvel Index to the Avengers vol.2 #5 (February 1995). Published by Marvel Comics. ^ Avengers vol. 3 #1 After being called to a meeting, Reed Richards comments "I know all three of us have served as Avengers..." in reference to himself, the Invisible Woman, and The Thing. ^ Official Handbook of the Marvel Universe: Avengers 2004 Published by Marvel Comics. ^ Official Handbook of the Marvel Universe: Avengers 2005 Published by Marvel Comics. ^ Avengers vol.3 #1 (amongst the team when all former members and nonmembers are summoned to battle Morgan le Fay) Jarvis comments on the fact that Demolition Man was "made an Avenger by Captain America himself." ^ Avengers West Coast vol. 2 #69 (April 1991). Published by Marvel Comics. ^ Avengers West Coast vol. 2 #74 (September 1991). Published by Marvel Comics. ^ Official Marvel Index to the Avengers vol.2 #6 (March 1995). Published by Marvel Comics. ^ New Warriors #26 (August 1992), published by Marvel Comics. After Rage was made ineligible, he still had access to the Avengers facility, until he aided the New Warriors in stealing an Avengers Quinjet, and his status with the team was revoked. ^ Avengers West Coast Annual #5 (1990). Published by Marvel Comics. ^ "Luke Cage is a New Avenger Again". Comic Book Resources. Retrieved March 2, 2010. ^ Official Marvel Index to the Avengers vol. 2 #4 (January 1995). Published by Marvel Comics. ^ a b Avengers Annual #17 (1988). Published by Marvel Comics. ^ "Spider-Woman Joins The Avengers". Comic Book Resources. Retrieved February 5, 2010. ^ "They Are Secret Avengers". Marvel.com. April 7, 2010. Retrieved April 7, 2010. ^ Phegley, Kiel (April 17, 2010). "C2E2: Cup O' Joe". Comic Book Resources. Retrieved April 18, 2010. ^ JK Parkin (April 14, 2010). "And your Secret Avengers line-up is ..." Comic Book Resources. Retrieved April 16, 2010. ^ Ching, Albert. "Inside the New Mutants-Infused Marvel NOW! AVENGERS Lineup". Newsarama. ^ "Has Izzy Dare name been changed to Kane in the..." New Brevoort Formspring. Retrieved 28 March 2018. ^ Ching, Albert. "Marvel NOW! Next Big Thing: UNCANNY AVENGERS Expands". Newsarama. Archived from the original on 2012-11-23. ^ "Marvel Inadvertently Leaks "Mighty Avengers" Mystery Member ID". comicbookresources.com. 28 October 2013. Retrieved 28 March 2018. ^ "Download the This Week in Marvel All-New All-Different Special". News - Marvel.com. Retrieved 28 March 2018. ^ "Clocking in with the New Avengers". News - Marvel.com. Retrieved 28 March 2018. This page was last edited on 21 April 2019, at 04:12 (UTC).